Seems I placed so many orders at YogaAccessories.com that the company decided to send me some samples to try out. First I'll review some of the items I ordered and paid for. 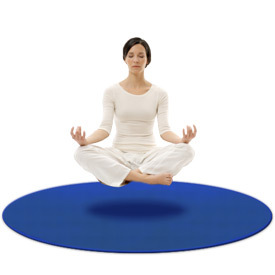 Round Yoga Mat : We sent a pair of these 6 foot diameter mats to our friends as a wedding present. I had originally gotten one for myself but it was just too heavy to lug around so I sent it back. Then, while looking for a gift for a couple who has everything, Roger and I realized that these mats would be perfect. The bride practices yoga and the groom is a yoga instructor. AND they have a yoga studio in their home, meaning they won't have the lugging around problem I had. Bride and groom give a thumbs up. $65. Yoga Stick-e Gloves : Previously, I reviewed competing product Yoga-Paws, which cost $35. At half the price I can solve the problem of slipping hands with Stick-e Gloves. 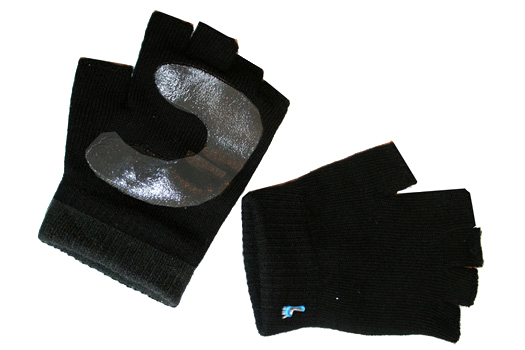 I like Stick-e Gloves also because they are not as bulky as the Yoga-Paws. However, I predict that they will also prove to be not as sturdy. Now for reviews of the complimentary items. Disclaimer: I received free samples (value $87) for purposes of sharing my honest opinions. Dragonfly Printed Yoga Mat : These gorgeous nature-inspired mats are double-thickness (1/4 inch) and extra long (74"). They come in purples, greens, blue and red. I had to scrub off the initial slickness from mine, but otherwise it's a beautifully serene mat to practice on. $25, with optional matching bag for $11. 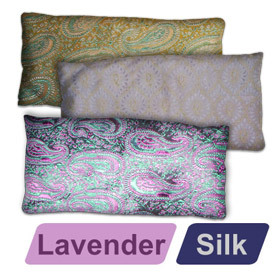 Deluxe Silk Eye Pillow: This soft flax-filled pouch is lightly perfumed with one of my favorite scents, lavender. It smells and feels relaxing when I place the pillow over my eyes for meditation or rejuvenation. $11. Bruce, the owner of YogaAccessories.com,is giving away an entire Nature Inspired mat set, valued at $47 (printed mat and bag, as above, plus a matching water bottle), to one All Thumbs Reviews reader. Just leave a comment below with the color of your choice (click over to see your choices) by April 5 and we'll randomly draw a winner. The mat set will be sent to the winner directly. Random.org selected #3, which means my partner Tami was drawn. Considering she's ineligible, I drew again, and #4 was chosen. So Flying Monkeys wins her olive/dark green bamboo mat set. Congrats to her, and thanks to everyone for entering! We have a yoga block set, and I will say it is very helpful for both my inflexible husband and my fibro-addled body. The dragonfly printed mat is SUPER-cute! I think the hibiscus lavender mat (style 2) is the cutest. I'll have to send this link to my yoga-instructor SIL. So you mean to say that if I used a block for half moon, I could reduce the number of times that I topple over? It's totally unlike me to pick any color that's not purple or blue, but there's something really nice about the Bamboo 2. I've just excavated a room in my house which is now my yoga room. What a difference it makes to have a beautiful, pristine, clean and quiet place to call my yoga home. The right tools are just as important to your yoga experience. I can imagine how the block and extra thick mat can make a big difference in presence throughout a yoga session. Sounds like my thumbs are up, too! I like the olive/dk green bamboo. I'm not very flexible so those blocks would be handy, I've never seen them that size before though. Wow, I love the light green bamboo mat! It looks so serene. These are fantastic! I love the red Koi printed mat! Beautiful and inspiring!!! Wow, free yoga stuff - yay! Thanks for reviewing these yoga accessories. I like to know how something works before I buy it. P.S. You looked great in your half-moon pose. :) Maybe I need a block like that to help me out!!! how did you KNOW I was in search of a new mat???? It seems my super discounted one from TJ Maxx just isn't cutting it anymore. I would love to replace it with the lavender dragonfly one. Those are really cool. I keep thinking I should give yoga a try again. I like the purple dragonfly one. oooooh - yoga block...heard those help the unflexable with some balance...and love dragonfly mat - girly exercise equipment rocks! A dragonfly printed yoga mat would be lovely. The dragonflies were a really popular symbol a couple of years back! I took am doing a giveaway, a couple of Neti Pot's once I hit 100 facebook followers! Thanks for having a subscribe by email option! I love that option! http://singerfeatherweight221.blogspot.com/ I use my singer fw to make eye pillows, and zafu's and yoga bolsters! DARN! And 6 weeks ago, I would have been the winner.